Fosteriana Tulips are also called the "Emperor Tulips." They are early bloomers with huge long colorful flowers which are good for cutting. Their leaves are broad, sometimes striped grey or green. Among the best for perennializing. Mid April. 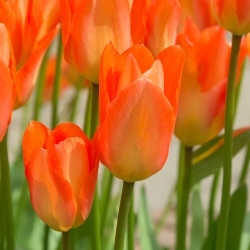 Orange Emperor is a Fosteriana Tulip has a carrot-orange flower, flushed yellow. One of the top ten in popularity. Naturalize well. 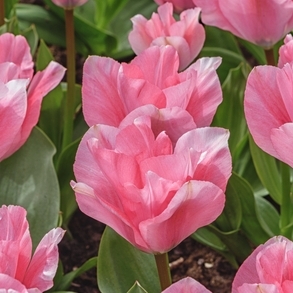 Pink Emperor is a Fosteriana Tulip with large deep rose-pink flowers. Also known as ‘Solva.’ Naturalize well. 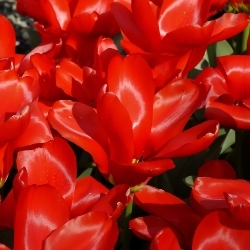 Red Emperor is an intense fiery red with a yellow heart. Also known as ‘Madame Lefeber.’ Naturalize well. 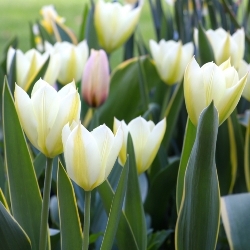 The White Emperor Tulip is also known as ‘Purissma.’ They are large and pure white with a creamy yellow base and heart. A good companion to Red Emperor. Like the other Fosterianas, they naturalize well. 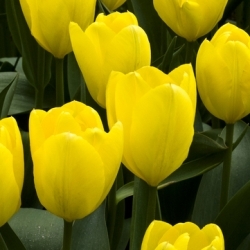 Yellow Emperor Fosteriana Tulips have large golden yellow blooms. They naturalize well. Mixed Fosteriana Tulips. A mix of the Emperor Tulip varieties. Naturalize well. Known for early blooms and large flowers. Our Fosteriana Tulip Collection contains 20 each of Red Emperor, White Emperor and Yellow Emperor, individually packaged and labeled.